Coming July 1 to a Lego store near you, the 2,863 piece Mountain Cave set is the most ambitious (and most expensive) official Lego Minecraft set yet. As an added bonus , it actually looks like a mine someone has crafted. Last year’s Village set was nice, but it didn’t exactly scream “mine.” Standing 12 inches tall, 20 inches wide and 11 inches deep, the Mountain Cave set is a relatively massive monument to the practice of removing cubes from the blocky Earth. The set features a motley cast of character primed to plumb its depths, careful to avoid things like spider generators . . .
. . . which seem like a very bad idea, as well as lighted lava elements . . .
. . . which are a much better one. Lego has released a video for the set, including an unboxing and building by the folks at Mojang. ● Trigger the charged Creeper explosion function. It’s an entire child’s birthday in a box, basically. 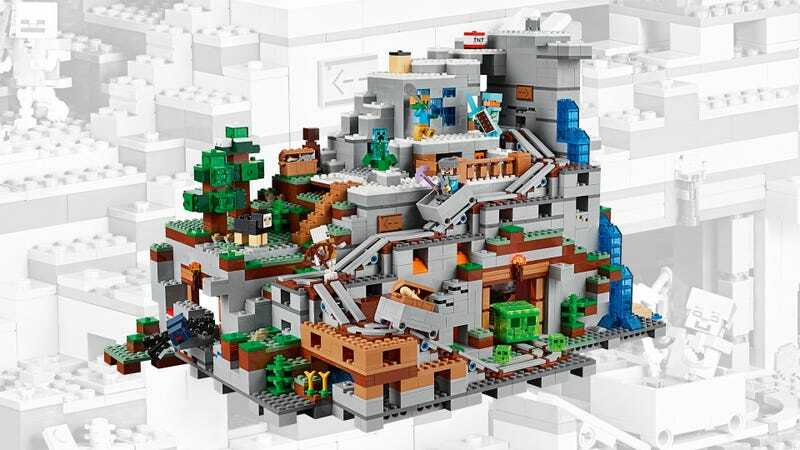 The Lego Minecraft Mountain Cave set will be available in Lego stores and the online Lego Shop on July 1.